Plastic Stemware martini glasses are great for champagne and wine if disposable is acceptable for your weddings or parties. 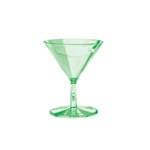 Also choose from libbey and anchor hocking glass martini glasses if you prefer real glass. Use versatile stemware from everything to beverages and frozen cocktails to desserts, appetizers and even soup. Anything that is served in a bowl looks even better in a glass! Anchor Hocking Martini Marbeya Glass 9 oz. Anchor Hocking Martini Ashbury Glass 6 oz. Emi Yoshi Square Martini Glass One Piece - 8 Oz. Libbey Martini Z-Stem Glass - 9.25 Oz. Libbey Vina Martini Glass - 10 Oz. Libbey Bravura Martini Cobalt Stem Glass Clear - 6.75 Oz. Libbey Martini Glass - 7.5 Oz. Libbey Embassy Martini Glass - 7.5 Oz. Libbey Martini Salud Grande Glass - 8.5 Oz. Libbey Vina Martini Glass - 8 Oz. Libbey Domaine Martini Glass Clear - 8 Oz. Libbey Embassy Martini Glass - 9.25 Oz. Excalibur Fully Tempered Cocktail Martini Glass - 7.5 Oz. Excalibur Martini Glass - 7.5 Oz. 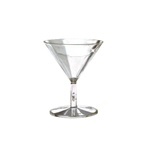 Stemless Martini Glass - 13.5 oz. Glass Martini Chiller - 5.75 Oz. EMI Yoshi Plastic Small Wonders Clear Merteeny Glass - 2 Oz. EMI Yoshi Plastic Small Wonders Sea Grean Merteeny Glass - 2 Oz. EMI Yoshi Plastic Resposable Martini Glasses Clear - 6 Oz. 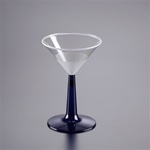 EMI Yoshi Plastic Martini Glasses with Blue Base - 6 Oz. 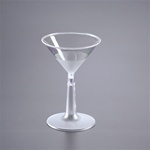 EMI Yoshi Plastic Mini Martini Glass Clear 2 Pieces - 2 Oz. Renaissance Martini - 7 Oz. restaurant supplies. Martinis are one of the most popular cocktails in America.